BACKGROUND: In clinical practice, the cytopenias may result from relatively benign causes such as viral infections and Vitamin B12/folic acid deficiency to more sinister causes such as bone marrow failure. In this study, we looked into the clinicohematological profile and etiological factors of bicytopenia and pancytopenia. OBJECTIVES: To study the etiology and clinicohematological profile in patients of peripheral blood cytopenias. MATERIALS AND METHODS: This was a cross-sectional study conducted at a tertiary care hospital over a period of 1 year. Cytopenias were defined as pancytopenia when there was simultaneous presence of hemoglobin <10 g/dL, total leukocyte count <4000/dL, and platelets < 100000/dL or as bicytopenia when two of the three blood cell lines were depressed. All patients who presented with pancytopenia and bicytopenia were included, and their clinicohematological profile was recorded. RESULTS: A total of 204 patients (103 males and 101 females) were diagnosed to have cytopenias. Pancytopenia was observed in 69/204 and bicytopenia was seen in 135/204 cases. The various causes of cytopenias included infections (n = 126 [61.76%]), megaloblastic anemia (MA) (n = 48 [23.52%]), drugs (n = 12 [5.8%]), hypersplenism (n = 8 [3.9%]), bone marrow failure syndromes such as aplastic anemia and myelodysplastic syndrome (n = 7 [3.4%]) and leukemias (n = 3 [1.4%]). We found a significant association between MA and pancytopenia (odds ratio [OR] = 2.47, P < 0.05) and also between infections and bicytopenia (OR = 5.8, P < 0.05). CONCLUSION: The present study concluded that infections and MA are the most common cause of bicytopenia and pancytopenia, respectively. The more serious disorders affecting the bone marrow constitute only <5% of all cases of cytopenias. BACKGROUND: Among the subtypes of acute myeloid leukemia, acute promyelocytic leukemia (APL) is a distinctive one. There are no published data regarding APL in Kurdistan, Iraq, so the data on this disease is limited. OBJECTIVES: The aims of this study was to recognize the epidemiology, clinical presentation, and to find out the outcome among APL patients at Nanakali hospital in Erbil city. PATIENTS AND METHODS: This was a retrospective study performed at Nanakali Hospital for blood diseases and cancer, Erbil, Iraq. Patients older than 18 years diagnosed with APL from January 2007 to December 2016 were involved in the study. 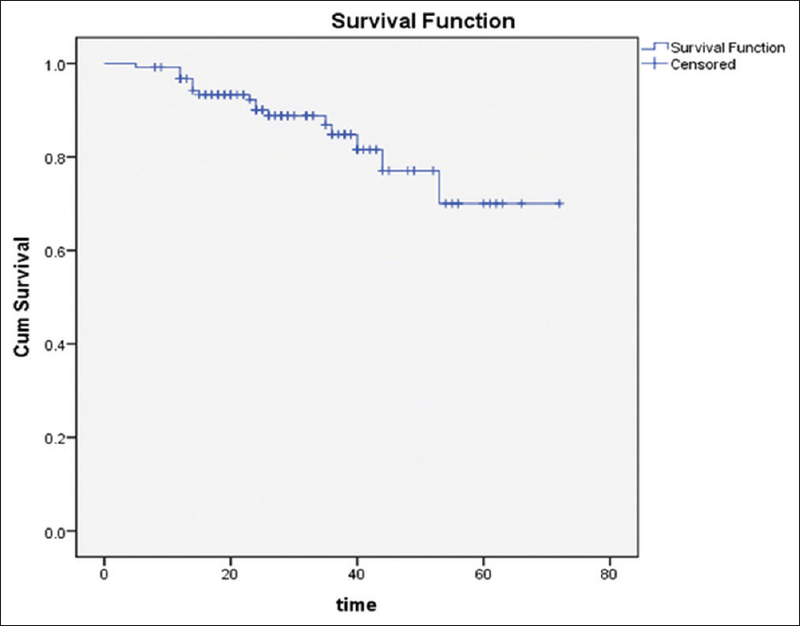 Chi-square test, Kaplan–Meier survival curves, and the Log-Rank (Mantel–Cox) test were used for data analysis. RESULTS: During the period of the study, APL was diagnosed in 90 patients. The mean age (± standard deviations) was 37.5 ± 15.5 years, and the median was 35.5 years, the male: female ratio was 1.3:1. Around 70% were living in urban areas. Regarding clinical presentations: 71.4% of the patients presented with generalized weakness, 64.44% with bleeding, 48.9% with fever, and 2.2% presented with thrombosis. The mean hemoglobin was 8.31 ± 2.69 g/dL, mean white blood cell count of 22.3 ± 29.4 × 109/L, and mean platelet count was 33.37 ± 27.5 × 109/L. The complete remission rate was 68.2%. Early death rate was 46.4% and the 5-year survival rate was 37.8%. CONCLUSION: The clinical and epidemiological features were compared with previously published studies. High-risk patients predominate in our study population. 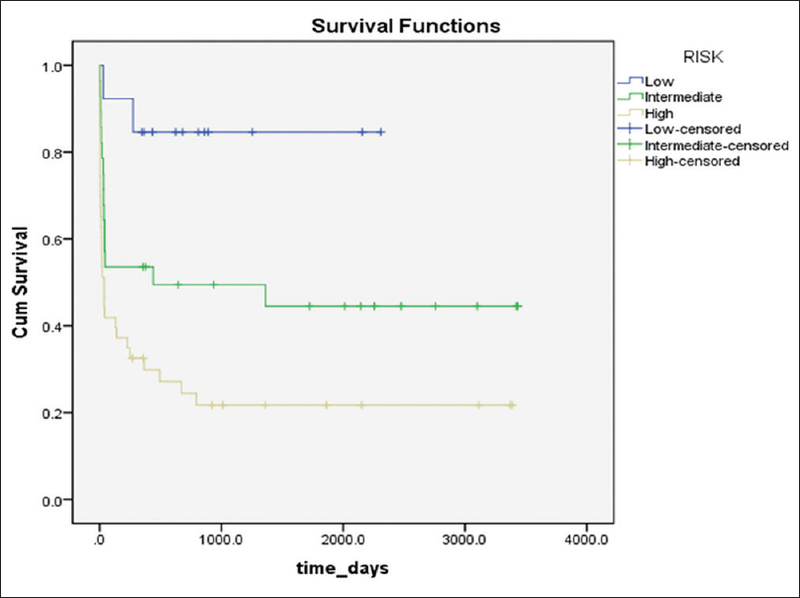 There was a significant association between the overall survival and risk score. BACKGROUND: Hodgkin lymphoma (HL) has unique epidemiological features with diversified pathologies and exhibits considerable clinicopathological variations in different parts of the world. OBJECTIVES: We aimed in this study to assess clinic-pathological features, immunohistochemistry and outcome of HL patients treated in Erbil, northren Iraq. 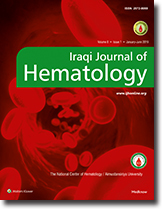 PATIENTS AND METHODS: This was a retrospective study conducted in Nanakaly Hospital for blood diseases and oncology in Erbil, North Iraq; a total of 125 patients diagnosed between January 2012 and December 2016 were involved; they were assessed for their clinical characteristics and histopathology and immunophenotyping findings and their outcome was evaluated as well. RESULTS: The median age was 28 years (range: 18–71 years); 55% were male and 41% had Stage II disease; common histological type is nodular sclerosis (51.2%) followed by mixed cellularity (43.2%); CD30 was positive in nearly all cases of classical HL, and CD15 was positive in 98.7% and CD20 was positive in 75% in nodular lymphocyte predominant subtype. Most of the patients received adriamycin, bleomycin, vinblastine, and dacarbazine chemotherapy, and the 5-year overall survival in our study is 70%. Advanced stage (IV), high lactate dehydrogenase level, low hemoglobin, and splenomegaly are significant predictors for poor survival. CONCLUSION: Our patient exhibited outcomes that were lower to those reported in developed countries. BACKGROUND: Gestational thrombocytopenia (GT) is considered as the most common cause of thrombocytopenia in pregnancy and accounts for about 75% of cases. OBJECTIVES: The objectives of the study are (1) to estimate the prevalence of GT among antenatal patients at Vardhman Mahavir Medical College (VMMC) and Safdarjung Hospital in New Delhi, India, and (2) to study the fetomaternal outcome in mild, moderate, and severe GT. MATERIALS AND METHODS: This is a prospective observational study done in the Department of Obstetrics and Gynaecology, VMMC and Safdarjung hospital in New Delhi, India, for a period of 6 months. All antenatal women underwent complete hemogram with manual platelet count in the third trimester. Those with platelet count 150 × 109/L were included and divided into three groups on the basis of platelet count. Maternal and fetal outcome was observed. Cord blood was sent for neonatal platelet count. Follow-up was done in these cases till 6 weeks postpartum. RESULTS: The prevalence of GT was 12.82%. Fetomaternal outcome was favorable. A total of five (2.5%) patients suffered from abruption. Postpartum hemorrhage was present in about 7 cases (3.5%). Blood transfusion including platelet transfusion was needed in around 13 cases (6.5%). There was no maternal mortality. Only 6 (3%) neonates were having thrombocytopenia (platelet count < 150 × 109/L) regardless of degree of maternal thrombocytopenia. Twenty-six (13%) neonates were admitted in nursery for monitoring; among these, 11 (5.5%) neonates' ventilation was needed. There was no neonatal death. CONCLUSION: Better fetomaternal outcome is seen in GT, so a vigilant and careful monitoring can prevent any adverse event. BACKGROUND: Acute leukemia is considered one of the most diseases that required frequent blood transfusion. Despite that blood transfusion is one of the main parts in the supportive management of acute leukemia patients, still, there are few data showing the exact requirements in regard to blood components for those patients. OBJECTIVES: The aims of this study were to review the predicted amount of blood transfusions needed for a patient with acute leukemia under a regimen of chemotherapy and to verify the transfusion frequency practices, according to the types of acute leukemia, levels of treatment, prognosis, and other demographic factors. 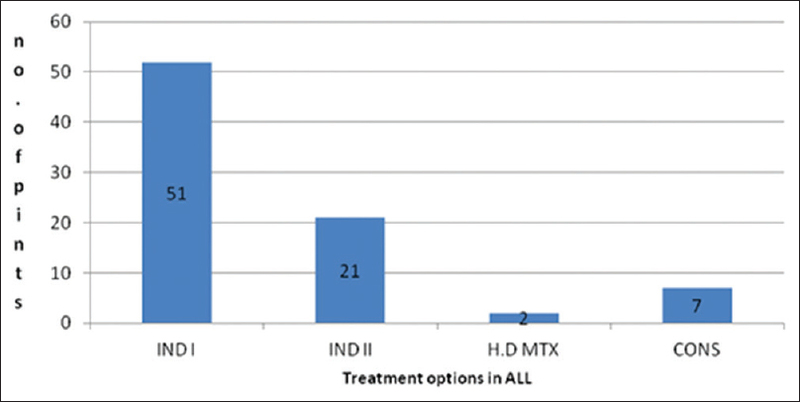 MATERIALS AND METHODS: A prospective cohort study conducted at the National Center of Hematology/Mustansiriyah University from January 2013 to January 2015. Thirty newly diagnosed patients were enrolled in this study. The inclusion criteria included newly diagnosed acute leukemia whether lymphoid or myeloid except acute promyelocytic leukemia (M3) patients who were excluded. All patients subjected to detailed history and routine hematological investigations. They were followed up and assessed during induction and consolidation phases for both disease entities. RESULTS: Thirty patients were included in this study; 20 were male and 10 were female. The mean age was 31.4 years, ranging from 15 to 66 years. There were 15 cases of AML and 15 cases for ALL. The number of transfused units was found to be higher and statistically significant in those below 40 years of age, male patients and in patients with complete remission, while it was not significant for type of disease. CONCLUSION: This study provides information to estimate the anticipated requirements for blood transfusion for those patients in regard to different factors which can be considered as guideline for these tertiary centers for accurate assessment of transfusion requirements and to direct resources for better outcome. BACKGROUND: Children with sickle cell disease (SCD) have a greater likelihood of demonstrating many medical complications that may put them at risk for a variety of difficulties, including poor school performance and cognitive impairment. OBJECTIVES: This study was designed to assess the school performance of primary school-aged patients with SCD compared to age- and gender-matched healthy students and to evaluate the factors that influence school performance in these patients. MATERIALS AND METHODS: A total of 68 patients with SCD from 48 primary schools and 68 healthy student classmates (control group), aged 7–12 years, were recruited. The average school examination scores were used as a school performance measure, while cognitive functioning was assessed by using the Draw-A-Person test. 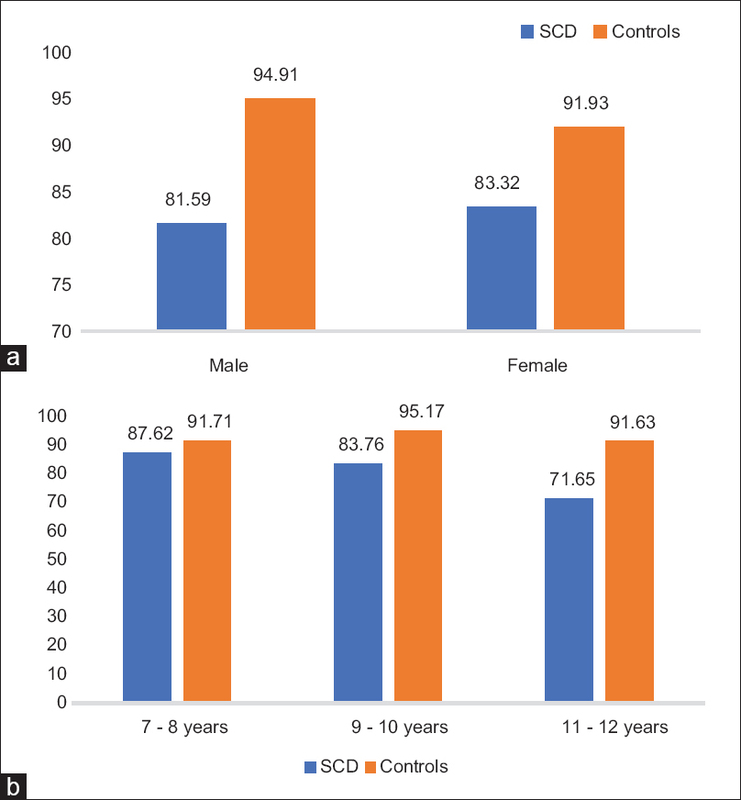 RESULTS: The average school examination scores and cognitive function scores of patients with SCD (82.46 ± 15.48 and 24.72 ± 7.48, respectively) were significantly lower than the corresponding scores of their classmate control group (93.42 ± 10.02 and 27.84 ± 7.46, respectively), P < 0.05. Students with SCD missed significantly more school days (12.37 ± 10.57) than healthy students (3.18 ± 3.62), P < 0.001, and high school absence was significantly associated with low school performance among SCD patients, P = 0.027. Among patients with SCD, Pearson correlation revealed a negative association between school performance and age and school absence days (r = −0.346 and r = −0.390, respectively, P < 0.01) and a positive association between school performance and maternal education (r = −0.388, P < 0.001). CONCLUSIONS: School performance and cognitive function were significantly lower among patients with SCD than among their classmates, and school absence and the age of patients had a negative impact on school performance. BACKGROUND: Acute leukemia and allogenic bone marrow transplantation BMT are immunocompromised conditions which may be susceptible for many opportunistic infections or reactivation of latent infections like Toxoplasma gondii (T.gondii). OBJECTIVES: The aims of study were to detect T.gondii in both acute leukemia patients and allogenic BMT recipients and to determine copy number of T.gondii in these groups in comparison to healthy individual as control group. METHODS: Sixty one acute leukemia patients enrolled in a prospective study from 1st December 2016 to 1st June 2017. Forty eight of them evaluated while induction chemotherapy (group I), while the other 13 within 1 year post bone marrow transplantation-BMT-(group II). In addition to 30 apparently healthy individuals as (control group), blood samples were collected from all groups. T.gondii DNA was extracted and then measured by Taqman quantitative real-time PCR. Measurement IgG and IgM antibody specific to T. gondii was investigated also in the control group by an enzyme-linked immune assay (ELISA). 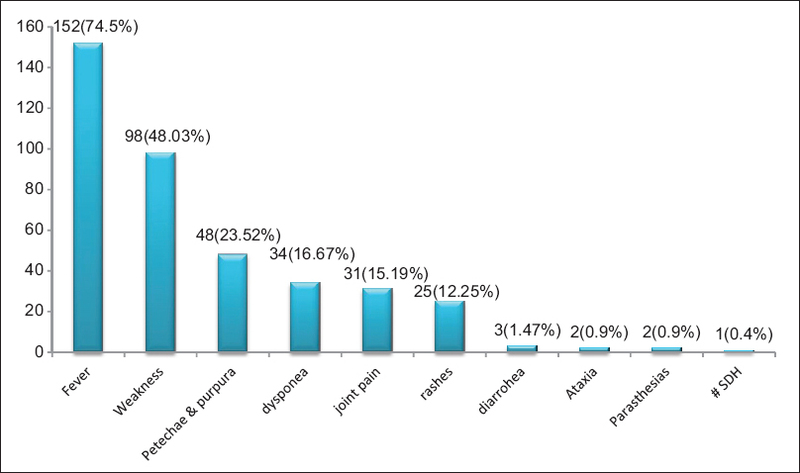 RESULTS: T.gondii parasitemia was detected in (8.3%) 4 out of 48 group I patient. While negative in group II and control group. The range of T.gondii load was (6.285×103-17.915×103) copy/ml, the mean of the copy numbers 11458.75± 5120.85. CONCLUSION: T.gondii should be looked for Leukemic patients at least by routine serological test for early diagnosis and early treatment if indicated. Quantitative PCR is used to monitor post BMT patients at risk for T.gondii disease and for a timely start of preemptive therapy. It has become important to be careful in terms of side effects with the increased lenalidomide use. The most commonly reported adverse events with the use of lenalidomide were hematologic toxicities and less frequently peripheral edema, infections, gastrointestinal disorders, fatigue, and muscle cramps. In particular, the nonserious rash is the most common cause of permanent discontinuation of lenalidomide. Although morbilliform, urticarial, or acneiform rashes have been observed with lenalidomide, malar rash-like lesions have not been described previously. 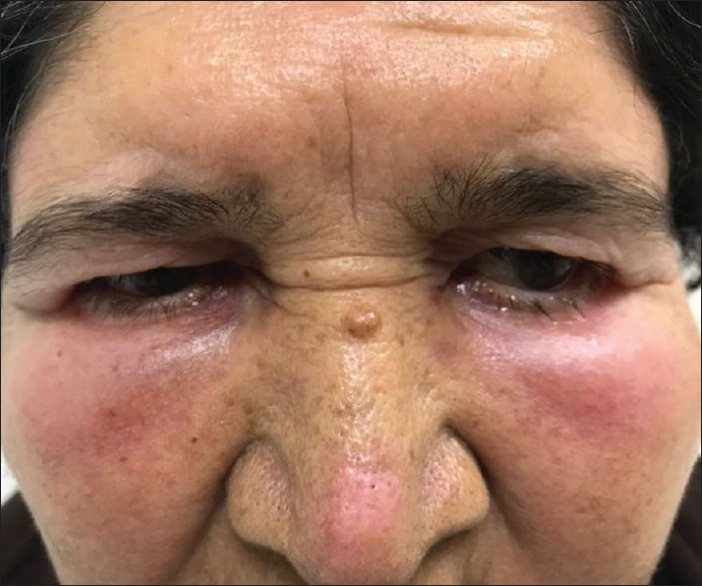 Our aim is to present here 71-year-old female myelodysplastic syndrome patient with deletion of 5q abnormality who should be discontinued lenalidomide due to recurrent skin reaction like a malar rash. Hemoglobin E (HbE) beta-thalassemia is common in Asian countries. Extramedullary hematopoiesis (EMH) is a chronic complication of this condition, which is a rare cause of paraplegia. Here, we discuss an uncommon presentation of HbE beta-thalassemia with EMH. 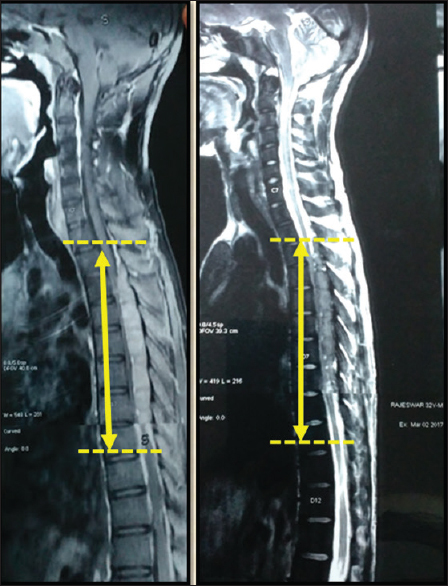 A 32-year-old male patient presented with spastic paraplegia at C7 level. Contrast magnetic resonance imaging showed epidural extramedullary soft-tissue clumps at D2–D7 vertebra. Histology section showed numerous pleomorphic large cells admixed with colonies of small cells having rounded contour. A relook at the history revealed a history of hemolytic anemia diagnosed at the age of 12 years, for which he was on 1–2 transfusions/year. HbE beta-thalassemia had been diagnosed 20 years before. Hence, a final diagnosis of EMH was made. Although such case reports have been documented, the amount of available data is limited. A high index of suspicion for EMH should be held in patients with hematological disease who present with neurological disorders.